Déjà Vu All Over Again ?? After a trip to India and Indonesia, I rushed back to Maine to join Richard in our work at the Orchard Quarry. Richard, with the occasional help of Tom Ryan and his crew, Mike and Glenn, had busied himself in my absence gnawing away at the schist mass. As always, a few good benches in the schist required a considerable amount of time hauling the muck from the pit. Our equipment continued, thankfully, to be in a co-operative mood. Once back, we spent 2 days squaring up the overhead schist on the right to insure our steady progress forward. Mining at this depth is somewhat of a chess game. 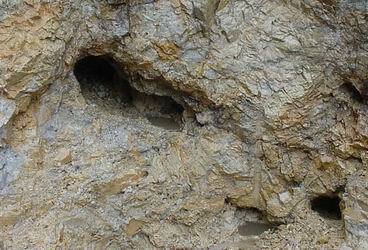 It is necessary to drill and extract the overburden in an order that allows comfortable and safe access for drilling. Once a 10' high section is carved out, what would have been easy drilling is now impossible or requires harnesses and great care. Richard is more cautious than I am. I joke with him saying that ' if I get my ticket punched, at least no one will say I died young '. Richard on the other hand has higher expectations for his staying power. 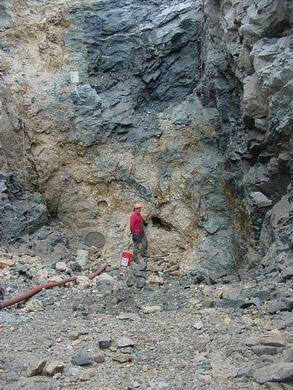 Once we were able to get down to the actual business of mining something other than schist, we could see a clear demarcation in the pegmatite and country rock defined by a transverse fault line. This fault was visible from the foot wall across the peg and up the hanging wall. The country rock on the west side of the fault was concordant with the pegmatite. 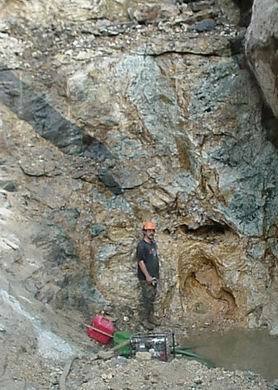 On the east side, the country rock has sagged into the pegmatite as can be seen in the left photo above. As a note of interest, the phenakites found in June were just to the west side of this fault. The tendency for the country rock to sag into the pit and coupled with its foliation increased the likelihood of a plate dropping into the pit. We spent considerable time prying these dangerous plates from the side walls. It is a little disconcerting to look up and see a 2' by 6' slap of schist leaning in on a 30 degree angle and aimed directly at your person. When we took our first bench on the east side of the fault, water began flowing rapidly from a small crack in the headwall. Driving a chisel into the crack, the volume and velocity of this water increased. Its temperature was quite cold. We has seen this phenomenon before in 1999. Then, while Mary was chiseling a beryl from matrix, her chisel opened up a ' gusher ' that spewed a stream of water 2 feet out from the rock face. Later work reveled that this stream was draining water from an extensive pocket system still within the headwall. A portion of this system can be seen in the righthand photo at the top of the page.\ We now expected to find a pocket system ahead. We were heartened when our next bench back exposed this new system. In the left hand photo Richard is standing beside the first exposure of what we hope will be a repeat of the '99-2000 pocket system. The pocket is at least 5' deep and 3' wide. 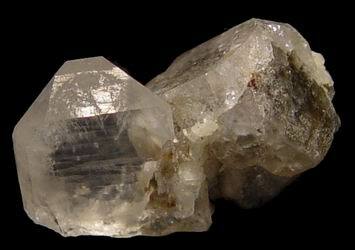 Its contents consisted of large quartz crystals to 18", parallel growth quartz plates, microclines with albites and apatites. Above the pocket, in the headwall, beryls were abundant. On the pocket fringe the beryls were completely dissolved and those a little further away etched. Finally just 6" away the beryls were unaltered. Further work exposed yet 2 more pockets below this one. The center pocket, no yet fully opened in this photo, is at least a ' hoe handle' (standard unit of measure) deep into the wall. 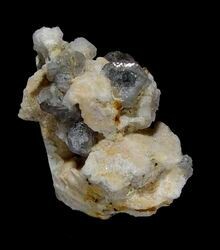 Beryl casts in albite and microcline were abundant in the pocket material. What is probably more remarkable about this new system is a schist inclusion (xenolith) can be seen at approxmiately the same location relative to the pocket as the 1999 occurrence. One major difference though is this schist is significantly more metamorphozed then the '99 xenolith. The '99 zenolith produced the golden beryl pocket and later, behind, the 2000 pockets. A concern is that this more extensive alteration may indicate that all of the gem stock within the pockets has been altered. 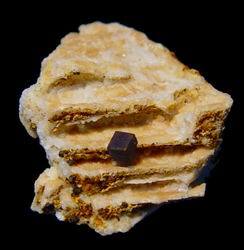 However, if the closed system pegmatite concept is valid, the beryllium may just be elsewhere. Hopefully we have not already found it.